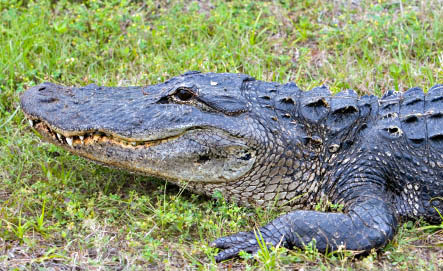 Alligators are indigenous to two locations. The southern United States and in China near the basin of the Yangtze River are the two places you may run into an gator. Although similar, there are some distinct differences in the two specimens. The American gator is larger than the Chinese gator. The American gator can reach a length of 19 feet and a weight of 600 pounds. The Chinese gator grows to six feet and weighs a lot less than its American counterpart. Both are prolific swimmers and prefer fresh water to salt water. There are occasions when they will be found in brackish water, but seldom in the salt water of the oceans. The Chinese gator differs from the American gator in another way. While the underside of the American gator is smooth, the Chinese alligator has a scaled underside. Alligators swim by using their lengthy tails to propel them through the water. The tail length is equal to the length of the body. The webbed feet are used to some degree, but the tail is the primary propellant. The tail of the alligator has other functions. The tail is a strong weapon against predators or potential food. This natural swimmer is known to be found throughout the state of Florida as well as other southern states. If there is a pond, stream or lake, there is a potential for gator population. When the gator comes on land, they are capable of a flat-footed, rapid burst of speed. The bursts are short, and very fast. During the spring, they are on land to build their nests and lay their eggs. The nest is very large. It can measure 3 ft. tall and 6 ft. wide. An gator can typically lay up to fifty eggs. The warmth of the materials in the nest helps the eggs to hatch. The weight of the gator would crush the eggs if she laid on them. She will help the babies out of the eggs and tend to their needs for at least one year. This includes the art of becoming a strong, natural swimmer. Baby gators will live on small fish, insects and anything that will fit into their mouth - all of which contains the micronutrients they need. As they mature, the food will get bigger. When the gators are fully grown, they will consume anything that they can swallow without chewing. They do not routinely kill with their mouths. Their tail is a much stronger weapon. In the event of a broken tooth, the gator will grow another one. With human habitation taking over much of their natural habitat, gators have been known to show up in many backyards in the southern states. Although once endangered, the American gators were saved from extinction by conscientious citizens. No longer are they hunted for their hides in the United States. The Chinese gators are currently endangered, and efforts are being made to protect these animals. They have survived since the age of dinosaurs and are a member of the dinosaur family. The perils they faced from natural occurrences were not as damaging as the things that human beings have done to them. One can learn how to swim better by watching these sea creatures. Their tails move their chi energy while their jaw size determines their diet.